Buenos Aires, Argentina – Perfect sailing conditions prevailed for second day of the J/24 World Championship as Newport, Rhode Island’s Tim Healy extended his lead over the 58-boat fleet. Healy’s consistent top-five finishes allowed him to claim a 20 point lead over Argentina’s Francisco van Avermaete, who retained the second place position after two more challenging races, each started under a black flag. 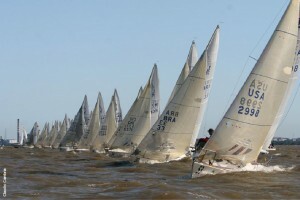 The first race was started in a 10 knot breeze, building to 15 knots by the end of the race. After a significant right shift on the first leg, Francisco Campero aboard Audi crossed the line first but was scored BFD giving Peru’s Luis Olcese the race win. For the second race the wind had increased to 18-20 knots and Healy found his form, leading the fleet wire-to-wire to finish the day. Back on shore, the competitors were treated to authentic paella and ice cream at the Yacht Club Argentino. 1. Tim Healy (USA) – 13 pts, 2. Francisco van Avermaete (ARG) – 33 pts, 3. Luis Olcese (PER) – 35 pts, 4. Matias Seguel (CHI) – 38 pts, 5. Miguel Saubidet (ARG) – 38 pts. 10 races are scheduled and racing will continue through Saturday. Live on-the-water updates about the racing can be found on the regatta Facebook page here: http://tinyurl.com/7ty6zpa.. — Event website: www.j24worlds2011.org.ar.